The title of the book is actually a little bit misleading. 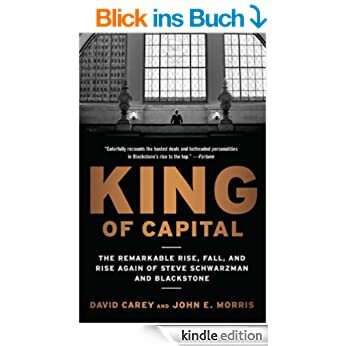 Yes, Blackstone and Steve Schwarzman play a large role in the book, but the book also covers the story of the whole private equity industry pretty well. After working for DLJ and Lehman, Schwarzman started Blackstone as a 2 person M&A advisory boutique in the 1980ties. As the M&A advisory business was somehow limited, Schwarzmann and his partner decided trying to get into the then fledgling private equity business. Just before they were out of money, they got their first investor money and then became on of the most succesful Private Equity players. What I liked the book ist that it looks not only at Blackstone but at the development of Private Equity since the 1980ties in general. There is also a lot of interesting detail to be found on specific deals which I found very interesting. For instance how Blackstone failed in Germany in the Cable sector and many more deals. Blackstone in contrast to some other players invests often in cyclical companies where timing is quite important. Most recently they also branched out big time into Real Estate. A funny side story is the fact, that Larry Fink started Blackrock as a division of Blackstone and relatively early bough the company out for a couple of hundred million USD. Blackrock is now a 65 bn USD market cap company, almost 20 bn more than Blackstone, its former parent. The author hinself seems to be relatively neutral or even slightly positiv on the general role of private equity and collects some good arguments. Overall, private equity investors like Blackstone are very close to what I would call “value investors”. Clearly, sometimes they extract that value petty quickly but many times they also create and grow companies like Blackrock. Overall those guys clearly have longer time horizons than most equity fund managers and one of their strengths is that they are not meassured against benchmarks on a monthly or quarterly basis. I guess that is the main reason why they can act very countercyclical. However, Private Equity is not a one-way street to success a s the side story of Forstmann-Little shows. In the 1990s, they were the predominant player but than went all in into telecom and technology and finally did not survive. Blackstone did some Telco deals as well but nothing which would harm them big time. As a summary, I can highly recommend this book who has a some interest on how Private Equity works and how those guys think. Very interesting book, liked to read it very much. And still up-to-date – with view from the crisis time to the current situation.